These instructions are intended for switching hosts temporarily, either automatically or manually. If you need to permanently change your host to a new system, see "Changing the Host System on a Multi-System Network" on our website. This section explains how to configure your network to perform a switch automatically, without the need for manual interaction. 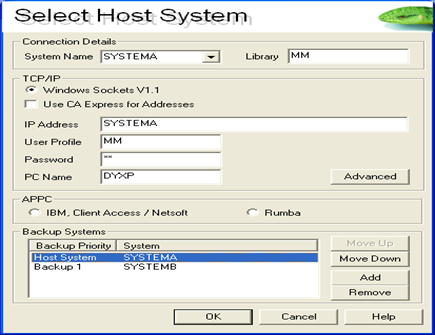 Ensure that the backup host (SYSTEMB) has been configured in MMNETMNT or via the Maintenance Module as a controlling system, and that it has a backup priority numerically greater than the standard host’s (SYSTEMA). To perform a change to the backup configuration, you must end the monitoring of that system. The reason for this is that the host system will need to perform a configuration synchronization with the newly defined backup host system. Start QMessage Monitor for the backup system from the host system. Remember to start the TCP server job first, if it hasn't already been started. Select the Monitor menu, then the Change Host option and then use the Add option to insert the backup system details. Connect the PC Console to the current host (SYSTEMA). When the backup host takes control, the PC console now automatically transfers as well. This section explains how to manually force a switchover, if required, for testing or maintenance purposes. On the current host (SYSTEMA), end the QMessage Monitor TCP server job (MMTCPSVR). End all of the jobs running under the user profile MM (ENDSBS MM *IMMED). Then, the backup host (SYSTEMB) takes control. The PC Console also transfers from the current host to the backup system automatically, providing you have configured it to do so (see the above section On the PC Console). On the standard host (SYSTEMA), restart QMessage Monitor, remembering to start the TCP server job first, if it hasn't already been started. Once the product starts, it then automatically regains control from the backup host. The PC Console (if configured to) also transfers automatically.